Cut the cheese into a small cube and set aside. Empty the water of the split peas then put them in a mixing robot and mix until obtaining a rather thin dough but not liquid. Put this paste in a bowl and add the coriander, onion, chilli, cumin and a little salt before mixing again. 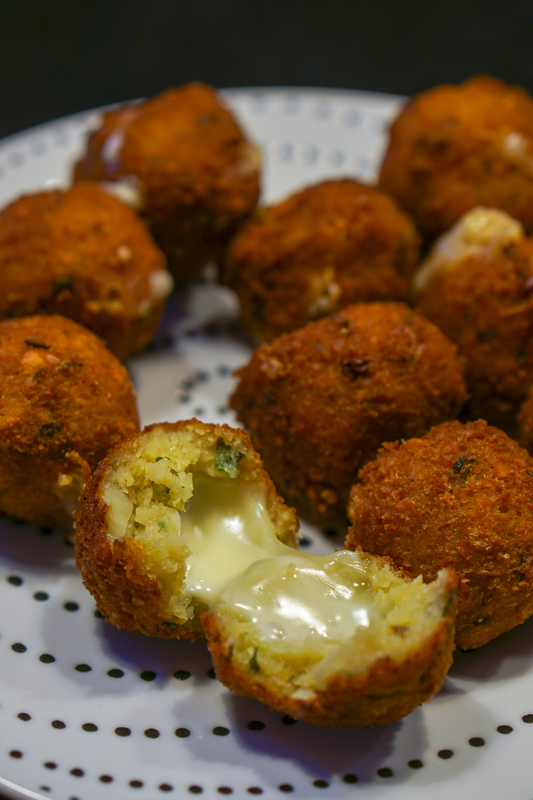 Make a ball with some chili pops dough, insert a cube of cheese in the middle and close to cover the cheese. Reserve and do the same with the rest of the dough and cheese. In a saucepan, heat the oil for frying. Test if the oil is hot enough with a small piece of onion and, if it is good, put the chili pops wit cheese balls one by one and cook until golden brown. Serve hot in bread with butter, in a farata with coconut chutney or as a gadjak with a coriander chutney.